“While the tools are available to everyone now, and even though it’s software and not hardware, you still have to learn what these things do,” Evick says. Like many artists today, Pete Evick is a man who wears several hats in his work and creative life. 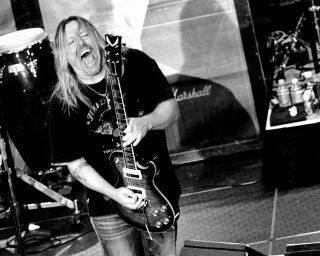 Most days, he can be found on a stage somewhere in the world, performing alongside Bret Michaels as the lead and rhythm guitarist in the Bret Michaels Band, who routinely log upwards of 200 shows a year on the road. But in addition to his talents as a player, Evick is also a skilled and experienced studio man, with numerous production and mixing credits to his name. Most recently, he produced, mixed and also helped to arrange Michaels’ newest track, “Unbroken,” which the Poison frontman wrote and performed with his 13-year-old daughter, Jorja. In the following interview with Guitar World, Evick discusses his work on the new track, including the gear he used both in his performance on the song as well as to help bring it to life in the studio. Additionally, he went deep on the studio process in general, from his go-to recording software and plug-ins, to offering pointers on what it takes to achieve the perfect mix, to his experiences working in the studio with legends like Ace Frehley, Phil Collen and Michael Anthony. And finally—returning to that “several hats” thing—Evick talked about his other job, running the eco-friendly candle company Shining Sol Candles. How did “Unbroken” come together from a writing, recording and production standpoint? “Unbroken” is a very special song because Bret co-wrote it with his youngest daughter, Jorja. It started with Bret and a beat, as it usually does. Bret is always about the beat and the vocal, which is unique. In fact, sometimes the entire song will be recorded with a drum beat and a vocal only and then we build music around it. But this time after the basic idea was sketched out, he took it to Jorja and they sat and wrote the song. Jorja had input on so much and played the piano as well as sang on the final track. Once the two of them had “the song,” I went back out to his studio to put it all together. When we had all the tracks down and Jorja and Bret were happy, we then had Eric Brittingham, the bassist in the Bret Michaels Band and who is from Cinderella, replay the bass with his flair, and our drummer Mike Bailey recut the drums in his own style. Both of them did an amazing job. I think the song feels incredibly natural and organic. Also, as a father Bret couldn’t be a more encouraging and inspirational figure. He supports both his daughters in the pursuit of all their dreams. And he doesn’t just do it through his celebrity—he has really instilled his own work ethic into them. What guitars and amps did you use on the recording? I used Bret’s Dean Z signature series model and my Dean Thoroughbred, which are both amazing guitars. The acoustic work was a Martin. I used all emulation plug-ins to do these tracks, because Bret is such a mad scientist when tracking and re-tracking, it’s just easier that way—anytime, anywhere, I can recall the exact amp model and settings. Literally, we have had songs finished and videos made and, like, the night before the release Bret will decide to change something. So the only way to be able to add on the fly like that is with the modeling technology. I have always been a big AmpliTube guy, but on this one I used the Steven Slate stuff. It’s amazing. How was it working with Jorja on the track? It was a truly great experience. I’ve been making records for a long, long time, and to work with someone so young yet so talented was great for me. She is very critical of herself—not insecure, but critical. Not just about pitch but actual timbre and things most people her age don’t even understand yet. Her pitch was great, and we doubletracked her voice for stereo imaging purposes and used no tuning software at all, just like her dad. In fact, my favorite part of this process was the mixing. As I would send the mixes, there is this one particular line, “Like a moth drawn to the flame” where several times I was given the direction to take Bret’s vocal down and bring Jorja up on that line. Since I was mixing it I was already aware that Jorja sounds identical to Bret. I’ve sang harmony with this guy for over 15 years now, 200 nights a year, and I can tell you, her delivery, her vibrato, everything is like his. So, finally, after a few times of having to bring Bret down and her up, I finally just took Bret out of that line completely but didn’t tell them. And sure enough, it came back again with “bring Bret down.” I laughed and said, “He’s not even in there anymore!” We all got a good laugh but it was awesome at that moment when everyone realized that Jorja has an amazing gift. How did you approach producing and mixing the song? We wanted this song to be really special, and have a huge-yet-organic sound to it. Technology is at a point right now where you can really do anything—if you have the ears and the knowledge, nothing is out of reach. Bret had suggested I listen to a few recordings I hadn’t heard, and when I did I knew exactly what he was hearing. So for a few days I just let myself be consumed with that sound and studied what the magic was and applied it to “Unbroken.” It was very important for me as well as Bret to create something that was timeless and new all at once. You can listen through it once and it sounds like a big rock tune, then you dig deeper and hear the kettle drums and strings and get a more current rock/pop feel. Then you listen again and you hear the synths and vocal production and its full-on modern movie-soundtrack stuff. So the approach was to have all those elements in their own space in different parts of the song, yet glue it together so it still sounded like a band in a room playing. Will this be part of a new Bret Michaels album? If so, has other work been done so far on that? I don’t have the answer to that, I assume so, but we haven’t discussed an album—it’s just not how it’s done much these days. It’s about the song more than anything. However, we do have some other really great stuff almost ready to go. You’ve been playing guitar in the Bret Michaels Band for over 15 years now. But you also play a significant role in his music from a production standpoint. What is your general approach when it comes to producing and mixing records? As a producer I believe that your job is to make the artist happy. I think some producers try to push their sound on a band, and in some cases that’s been extremely successful. But I like each record I do to sound different. Maybe there are some signature things as far as effects or drum sounds, but I don’t want to paint the same picture every time. Luckily, Bret is like this, too—he has never said to me, “Let’s make this sound like ‘Every Rose’ or ‘Nothin’ But a Good Time.’" He’s always reaching to do different or new things. So every time I start a recording I start clean, with no preconceived notion of what the song will end up as. Sometimes it’s going in one direction and suddenly we will swing it totally to a whole different direction, even switching the actual genre of the song just by changing guitar and drum tones. However, when it comes to mixing I do have certain things that I have been doing for years that I think still hold up—I still listen to Reckless from Bryan Adams and think, One day I’ll make a record like that.. Even though I'm a singer/guitarist, when mixing records I obsess with the bottom end and the kick and bass guitar relationship. I want rock records with hip-hop bottom end, which is much harder to achieve than it seems. You worked with Bret on his Jammin’ With Friends album, which featured guests like Ace Frehley, Michael Anthony and Phil Collen. How did you approach working with each of those artists? First off all, three of those guys are enormous heroes of mine. Anyone that knows me knows Kiss and Van Halen are what started my whole journey, and there is not a musician / producer my age that wasn’t influenced by Def Leppard. When Bret came up with the idea of having them appear on the album, it happened very fast and everyone was on tour or doing their own things. And we were on tour as well. I had a killer mobile Pro Tools rig out with me with some real great 500 Series preamps, and basically with most of the guys I flew to them or they flew to me and we tracked it with my mobile rig. Each experience was different. With Ace, he was so cool and experimental. He did about 25 different takes of the solo, and I would just crack up because each one had at least one of those special Ace licks, and I’d be sitting there trying to be a pro, and all of a sudden I was 13 years old when he would pull out the “Speeding Back to My Baby” lick or the “Shock Me” lick. Then he said, “Go ahead and comp it and come get me when you’re done.” So I took about 30 minutes and comped what I thought was a classic Ace solo. He came in and said, “That’s pretty good, but I’m having fun. Let’s do some more so you have more to work with.” He’s really into trying different things. When I met with Michael, I set my gear up and plugged him in and just let it go. And he was done in one take. We laughed that it took me longer to set up than to do the take, so he suggested giving me a couple more takes, each one slightly more sophisticated that the last. With Michael, there’s really no real “approach,” he just does it and does it flawlessly. With Phil Collen, he did his tracks on his own at his studio and we did all the communicating via phone and text. To be honest with you my approach with Phil, was, “Learn anything and everything I can.” Because as a producer, I would like to hear anything anyone has to say about Pyromania and Hysteria—even the janitors and receptionists at the studios! What is some of your go-to studio recording gear? Right now I’m a total in-the-box guy. I’m doing it all with plug-ins. Just a few years ago I had all this great vintage hardware, Neve and API and the like, but in recent years Universal Audio and Steven Slate have just crushed it with their software. On the road I use a Universal Audio Apollo Twin and at home I use the Apollo 8. And the Steven Slate plug-ins are basically my go-to. There is nothing they can’t do—from drum samples to compressors he’s got it all. Guitar-wise, I use my Dean Thoroughbred and my Dean NashVegas. What advice would you give to a budding studio producer—or even people recording on their laptops—about how to achieve a good-sounding recording and mix? Well basically everything is done on the laptop now—the world’s top mixers are mixing in their kitchens. One of my closest friends is the amazingly talented mixer Jeff Juliano, who has countless awards. He’s mixed everything from iconic rockers like Shinedown to current country chart toppers like Dan + Shay and he will send me pictures of himself mixing on his boat. It’s incredible. So with that being said, I would say that while the tools are available to everyone now, and even though it’s software and not hardware, you still have to learn what these things do. Don't just buy a bunch of gear and assume it will do it for you. You can absolutely get world-class recordings with your laptop, but you still have to understand what a compressor does. You can’t just pick a preset and go with it, it just doesn't work that way, Put the hours in, turn the knobs—even if they’re virtual—make it sound good, then screw it all up and make it sound better. Take advice from people you trust, but also know there are no rules in music. As far as the technical stuff, learn your frequencies, learn what steps on something else and learn how to fix it. Take that stuff seriously—so many people never take the time to understand the frequency bands. It’s crucial to being able to work quickly and efficiently. Most importantly, get good takes. You can fix a lot of things these days, but an amazing vocal is still an amazing vocal. It has to come from a human, not a machine. What do you have coming up in 2019 musically? Since the release of “Unbroken,” the Bret Michaels Band are back on tour so we will be pretty busy with that the rest of the year. And we’re doing some amazing things this year, including performing at Graceland in Memphis and at the huge Stagecoach festival in California. However, I’m always itching to mix, so hopefully I’ll find a few artists that think I’m a good match for their music. Finally, in addition to all your music work, you also run a business, Shining Sol Candles. Can you tell us what’s new there? Shining Sol has really become something, We are an ecofriendly, all-natural soy wax wooden wick candle company, and while we do several things in the traditional home decor world, we are unique in that we have licenses with several artists, from Kiss and Def Leppard to Debbie Gibson. And we have an entire collection of music related candles. Obviously we make the Bret Michaels candles, and just recently we acquired the license to use all of Paul McCartney and John Lennon’s lyrics on our products, so that’s huge to us. Thanks for asking!